Should I Hire a Plumber? You hear drip, drip, drip as you stand near your kitchen sink. A small sound that swells in your ear with each drop. 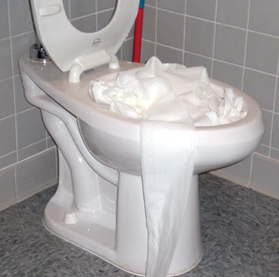 Your mind starts to race…is this a small problem or am I going to need to hire a plumber? No one likes to hear a dripping faucet, a clogged toilet or see water standing instead of draining from a sink, but it is a fact of life that sooner or later plumbing problems will occur. Before you panic about costs, take a couple of deep breaths and access the problem. Plumbing problems can come in a multitude of symptoms. Whether or not you need a pro will be determined by what you find. No Hot Water is usually traced back to your hot water heater or tank. If your heater is electric, it may be a faulty part within the heater such as heating elements or a bad thermostat. A gas heater could be as simple as a check to make sure the pilot is still lit. If the entire heater has to be replaced, you should call in a professional plumber to handle the job. Frozen Pipes quickly become cracked pipes. If it’s just frozen, a hairdryer can help slowly thaw the problem. If you see water spewing out of the pipe, that means it already burst so you probably should start dialing the plumber. Low Water Pressure could a sign of obstructions in the water line, a leak in the pipe or a problem from the city supply or a well. If you can’t eyeball the problem and detect leakage, you probably will need to call in a plumber who can quickly analyze the problem and help resolve it. Clogged Drain could one of those problems you can easily fix yourself. If you have a snake handy to run down the sink or tub drain, you may be able to dislodge the hairball or obstruction. There are products to pour in the sink to dissolve clogs, but be sure to follow the package instructions. If these two options fail you, it might be time to bring in a pro. Washing Machine Hoses that burst can spew up to 500 gallons of water per hour, once that happens, the damage adds up quickly and can quite extensive. A little maintenance beforehand can avoid a major problem later. Check your hoses at least once a year and replace if worn or cracking. Make sure to unplug the machine and turn off water supply before attempting to replace the hose. If properly maintained, you only have to replace your hoses every five years or so. Once a hose burst, you may need a professional plumber to handle it. Maintenance is the key to avoiding a big plumbing bill. Depending on your skill level, you may be able to handle replacing worn and faulty parts. Major plumbing repairs will require a plumber. Remember, not all plumbers are created equal or charge the same. Shop around and compare service costs and still get the best bargain.